© Sato et al. Licensee Bentham Open. This study aims to compare the morphology of the A1 pulley and flexor tendons in idiopathic trigger finger of digits other than the thumb between in neutral position and in the position with the interphalangeal joints full flexed and with the metacarpophalangeal (MP) joint 0° extended (hook grip position). A total of 48 affected digits and 48 contralateral normal digits from 48 patients who initially diagnosed with idiopathic trigger finger were studied sonographically. Sonographic analysis was focused on the A1 pulley and flexor tendons at the level of the MP joint in the transverse plane. We measured the anterior-posterior thickness of A1 pulley and the sum of the flexor digitorum superficialis and profundus tendons, and also measured the maximum radialulnar width of the flexor tendon in neutral and hook grip positions, respectively. Each measurement was compared between in neutral and in hook grip positions, and also between the affected and contralateral normal digits in each position. In all the digits, the anterior-posterior thickness of flexor tendons significantly increased in hook grip position as compared with in neutral position, whereas radial-ulnar width significantly decreased. Both the A1 pulley and flexor tendons were thicker in the affected digits as compared with contralateral normal digits. The thickness of flexor tendons was significantly increased anteroposteriorly in hook grip position as compared with in neutral position. In trigger finger, A1 pulley and flexor tendon were thickened, and mismatch between the volume of the flexor tendon sheath and the tendons, especially in anterior-posterior direction, might be a cause of repetitive triggering. Keywords: A1 pulley, flexor tendon, hook grip, metacarpophalangeal joint, trigger finger, ultrasonography. Although trigger finger is one of the most frequent disorders of the hand, its pathophysiology and the mechanism of triggering are not fully understood. The digits other than the thumb have two flexor tendons, the flexor digitorum superficialis (FDS) and flexor digitorum profundus (FDP), and they are caught at proximal portion of the A1 pulley when the digits fully flex in this disease. 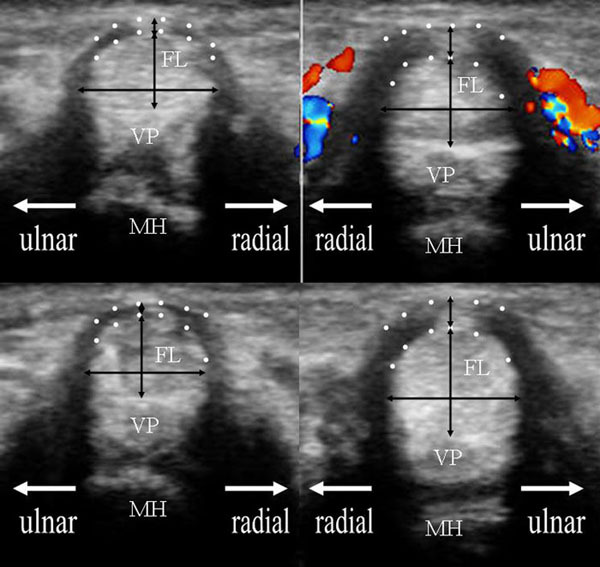 Ultrasound allows for noninvasive visualization of the soft tissues, and also provides good depiction of annular pulleys [1-3] and flexor tendons . Previous studies reported thickening of the A1 pulley and/or flexor tendon as a hallmark of trigger finger on ultrasound [5-10]. Guerini et al.,  reported thickening of the A1 pulley in all sonographically examined 33 fingers with painful triggering. Kim et al.,  emphasized that some trigger fingers exhibit sonographic abnormalities of the tendon and its sheath but without abnormalities in the A1 pulley. Some studies have also shown that the sonographic appearance of the pulley and/or flexor tendon in the trigger finger is correlated with clinical severity [8-10]. We had an interest in the morphologies of pulley and flexor tendon at the level of metacarpophalangeal (MP) joint in the flexion position of digits other than the thumb as it seems that the thickened area of the tendons should be within or proximal to the level of A1 pulley in this position. Although it is difficult to observe these tissues sonographically at the level of MP joint when the digits deeply or fully flex, the position with the distal and proximal interphalangeal joints full flexed and with the MP joint 0° extended (hook grip position) is usable if we use the transverse plane. In this study, we aimed to compare the morphology of the A1 pulley and flexor tendons in idiopathic trigger finger of digits other than the thumb between in neutral and in hook grip positions by measuring the thickness of these tissues sonographically. The institutional review board approved this study protocol. All patients were informed of the study aims and procedures and signed a consent form that included a description of the protocol. During nearly the 3 year period from March 2012 through January 2015, consecutive patients who were clinically diagnosed with idiopathic trigger finger in our clinic and had no other affected digits nor a previous history of triggering in other digits were recruited to this study. Patients with diabetes mellitus, rheumatoid arthritis, dialysis treatment, fingers with a history of local gouty/pyogenic disease, or major hand trauma were excluded from this study. Plain radiographs were evaluated in all patients. We confirmed that none of the included patients had a history of trauma, tumors, calcium deposits, or severe osteoarthritis. A total of 48 affected digits and 48 contralateral normal digits from 48 patients (19 men and 29 women; age, 23–78 years; mean age, 56.5 ± 10.7 years) were studied sonographically. The examined digits included 3 index, 30 middle, and 15 ring fingers in affected and contralateral normal digits, respectively. There was no small finger triggering in our cases. Sonographic evaluation was performed at the time of their initial visit to our clinic. Each digit was evaluated sonographically at the level of the MP joint in the transverse plane. Patients’ hands were positioned in supination with the wrist joint in a neutral position, and the probe was positioned with minimal pressure. The probe was so placed as the palmar surface of the proximal phalanx disappeared on the image by moving the probe from the distal to the proximal side of the MP joint. Sonographic analysis was focused on the A1 pulley and flexor tendons, and these tissues were observed in neutral position (MP, distal and proximal interphalangeal joints 0° extended position) and in hook grip position, respectively (Fig. 1). If interphalangeal joint contracture was present, the joint was extended as much as possible. The probe was positioned perpendicularly against the palmar surface of the examined digit. Images were created on a display showing a side by side comparison of the right and left digits to view the same position. Position of the probe in the sonographic study. Left and right images present the neutral position and hook grip position of transverse plane study, respectively. Sonographic evaluation was focused on the MP joint. We measured the anterior–posterior thickness of the hypoechogenic bundle including the A1 pulley and flexor tendons, and also measured the maximum radial-ulnar width of the flexor tendons (Fig. 2). With regards to the measurement of flexor tendons, we evaluated the flexor digitorum superficialis and flexor digitorum profundus as if a single tendon was present because we were unable to distinguish these two tendons sonographically in a static position. We identified the flexor digitorum superficialis and flexor digitorum profundus tendons dynamically for differential motion in advance of the tissue measurements. All affected digits were diagnosed and sonographic evaluation was performed by a senior hand surgeon with 14 years of experience in surgery and 3 years of experience in ultrasound. In the sonographic study, the Avius ultrasound system (Hitachi-Medico Co., Tokyo, Japan) and a linear array 13.5 or 17.0-MHz transducer (contact area, 14 × 59 mm) were used. To ensure reproducibility of the calculated distance, we repeated tissue measurements twice on 20 randomly selected affected fingers. The maximum intraobserver error was 0.3 mm for all analyses. The comparison of sonographic images between unaffected left ring finger (left image) and affected right ring finger (right image) of 69 years old woman including anatomical reference. The upper and lower images exhibit the transverse image at the MP joint in the neutral and hook grip positions, respectively. The flexor tendon was measured on the longitudinal and transverse axes: anterior–posterior thickness and radial-ulnar width. The hypoechogenic bundle including the A1 pulley at the rim of the flexor tendon, which is delineated by two dotted lines, was also measured on the top of the tendon. The A1 pulley thickness was defined as the longitudinal axis of this area, including the centralized hyperechogenic area. The black arrows indicate these measurements. The Dopplar flow around the A1 pulley was also recognized. FL: flexor tendon, VP: volar plate, MH: metacarpal head. Analyses of tissue measurements focused on the difference between in neutral and in hook grip positions, and also between the affected and contralateral normal digits in each position. Comparisons were performed using the paired t-test and Student’s t-test, respectively. Results were deemed statistically significant at P < 0.05. Tables 1 and 2 present the results of the measurements in the affected and contralateral normal digits, respectively. In all the digits, the anterior-posterior thickness of flexor tendons significantly increased in hook grip position as compared with in neutral position, whereas radial-ulnar width significantly decreased. Table 3 presents the result of the comparison between the measurements of affected and contralateral normal digits. Both the A1 pulley and flexor tendons were thicker in the affected digits as compared with contralateral normal digits, whereas there was not significant difference in radial-ulnar width. The result of the tissue measurements in affected digits. The result of the tissue measurements in contralateral normal digits. The result of the comparison between the measurements of affected and contralateral normal digits. The A1 pulley was previously reported to comprise two distinct layers: an outer, richly vascularized layer and an inner, avascular, flexor tendon gliding layer [6, 11]. Although its process was not resolved, A1 pulley and flexor tendon were reported to be thickened in trigger finger [5-10], and it was also shown in our study. Sampson et al., reported that the A1 pulley and the palmar surface of the flexor tendons of patients with trigger finger showed fibrocartilaginous metaplasia in which the number of chondrocytes and volume of adjacent extracellular matrix were significantly increased . Drossos et al., suggested that as the trigger finger worsens, the gliding surface begins to wear and is gradually replaced by secondary invasive hyperplasia from the outer layer; progressive vascular hypertrophy of the A1 pulley then diminishes the inner diameter of the flexor tendon sheath, preventing harmonious gliding of the flexor tendons . In such a situation as trigger finger in which the flexor tendon thickened anteroposteriorly, great stress might be applied between the gliding surface of A1 pulley and flexor tendon. Our study result showed that the anterior-posterior thickness of flexor tendon at the level of the MP joint increased in hook grip position as compared with in neutral position even in the normal digits. Much more stress might be supposedly applied with hook grip position or with the digit fully flexion in trigger finger. On the other hand, radial-ulnar width of flexor tendon at the level of the MP joint decreased in hook grip position in all digits. This might be one explanation for the cause of previously reported pathological change of A1 pulley and flexor tendon in the patients with a long-standing trigger finger [6, 11], and also support the hypothetic explanation for triggering that it might be due to mismatch between the volume of the flexor tendon sheath and the tendon , especially in anterior-posterior direction. Our study has several limitations. First limitation was relatively small sample size. Secondly, we used clinically normal contralateral digits as the control group without considering the patients’ hand dominance, age, job, or presence of underlying diseases. These factors would have influenced the tissues and potentially led to degenerative and inflammatory changes, although we excluded such cases to the greatest extent possible when selecting the control group. Thirdly, the same person made diagnosis and performed all the sonographic examination, and we did not blind the sonographer to the information regarding the affected side. The result of this study contains substantial bias arising from this limitation. Fourthly, we did not take the flexibility of the tendons into consideration. Although the anterior–posterior and radial-ulnar diameters of the tendons might change when they are within the A1 pulley, we measured only the diameter and did not measure the area of tendons in this study. The thickness of flexor tendon was significantly increased anteroposteriorly in hook grip position compared with in neutral position. In trigger finger, A1 pulley and flexor tendon were thickened, and mismatch between the volume of the flexor tendon sheath and the tendon, especially in anterior-posterior direction, might be a cause of repetitive triggering. We thank Ishii Orthopaedic & Rehabilitation Clinic for bearing the necessary expenses for the publication of this article. Hauger O, Chung CB, Lektrakul N, et al. Pulley system in the fingers: normal anatomy and simulated lesions in cadavers at MR imaging, CT, and US with and without contrast material distention of the tendon sheath. Radiology 2000; 217(1): 201-12. Boutry N, Lardé A, Demondion X, Cortet B, Cotten H, Cotten A. Metacarpophalangeal joints at US in asymptomatic volunteers and cadaveric specimens. Radiology 2004; 232(3): 716-24. Boutry N, Titécat M, Demondion X, Glaude E, Fontaine C, Cotten A. High-frequency ultrasonographic examination of the finger pulley system. J Ultrasound Med 2005; 24(10): 1333-9. Martinoli C, Bianchi S, Dahmane M, Pugliese F, Bianchi-Zamorani MP, Valle M. Ultrasound of tendons and nerves. Eur Radiol 2002; 12(1): 44-55. Guerini H, Pessis E, Theumann N, et al. Sonographic appearance of trigger fingers. J Ultrasound Med 2008; 27(10): 1407-13. Sampson SP, Badalamente MA, Hurst LC, Seidman J. Pathobiology of the human A1 pulley in trigger finger. J Hand Surg Am 1991; 16(4): 714-23. Kim HR, Lee SH. Ultrasonographic assessment of clinically diagnosed trigger fingers. Rheumatol Int 2010; 30(11): 1455-8. Serafini G, Derchi LE, Quadri P, Martinoli C, Orio O, Cavallo A. High resolution sonography of the flexor tendons in trigger fingers. J Ultrasound Med 1996; 15(3): 213-9. Sato J, Ishii Y, Noguchi H, Takeda M. Sonographic appearance of the flexor tendon, volar plate, and A1 pulley with respect to the severity of trigger finger. J Hand Surg Am 2012; 37(10): 2012-20. Chiang CH, Kuo LC, Kuo YL, et al. The value of high-frequency ultrasonographic imaging for quantifying trigger digits: a correlative study with clinical findings in patients with different severity grading. Ultrasound Med Biol 2013; 39(6): 967-74. Drossos K, Remmelink M, Nagy N, de Maertelaer V, Pasteels JL, Schuind F. Correlations between clinical presentations of adult trigger digits and histologic aspects of the A1 pulley. J Hand Surg Am 2009; 34(8): 1429-35. Ryzewicz M, Wolf JM. Trigger digits: principles, management, and complications. J Hand Surg Am 2006; 31(1): 135-46.